Paperbacks from Hell is not the sort of book I would normally gravitate towards, in general I don’t real much non fiction and I rarely read a horror novel. But when I was a kid, mainly from around nine to thirteen I read a ton of R. L. Stine, Christopher Pike and the southern gothic horror of V. C. Andrews. When I was offered a review copy of this book I thought it would be a great opportunity to revisit some long forgotten authors, but I didn’t anticipate being so fascinated by the history of horror fiction! This is a cross between a textbook and a coffee table book, it sounds weird, and it totally is, this book definitely has a touch of odd, but it works brilliantly. It’s a really cool book, the pages are matte and the quality is outstanding. There is a plethora of amazingly horrifying old book covers that made me laugh and cringe, they’re so bad they’re good, and Hendrix has culminated a list of the best of the worst divided into chapters based on what was hot at the time. There are sections on creepy kids, cults, gothic romance, animal attacks and science mishaps and much more. He also provides some insight into what publishing houses were going for during the seventies and eighties and it was shocking, eye opening and totally entertaining. This was a really fun read, a total blast from the past and one that even caught my husband’s eye while I was reading it. Mostly in a WTF are you reading now kind of way, but still. I can’t wait to leave this laying around the house, it’ll be an awesome conversation piece and I can see myself flipping through it again and again for amusement. So awesome, I loved Grady Hendrix’s MBFE and I didn’t know aout this one! I remember you liking that one! 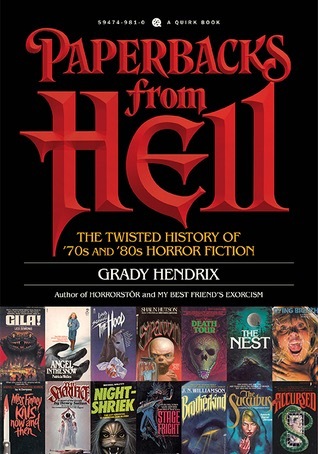 Check out this review of the book, Paperbacks from Hell, by Grady Hendrix, from this post on the Novel Gossip blog.